Exmouth is a nature-lover’s dream. A place where clear turquoise waters host an incredible diversity of fish and colourful coral life on the coast of Western Australia. With the World Heritage-listed Ningaloo Reef only metres from shore at Coral Bay, Exmouth is the gateway to one of the most pristine marine parks in the world. Base yourself in Exmouth to explore the natural wonders of Ningaloo Reef, home to our ocean's most fascinating creatures: whale sharks, manta rays, humpback whales, turtles and dugons. Whether you’re travelling with children, in a group, on a budget or away for a romantic weekend – Exmouth offers a range of accommodation to suit your requirements. For water views and only meters from the shoreline you’ll find Mantarays resort, located on Sunrise Beach – the ideal spot to stay to catch a glimpse of whales frolicking in the Exmouth Gulf. If the reason you’ve come to visit is to scuba dive and snorkel with over 200 varieties of coral and 500 species of fish, you may prefer to stay with other like-minded travellers at one of the campgrounds, backpackers or holiday parks. If you’re after mid-range accommodation, opt for one of the holiday house, villas or hotels near the main street. For a truly luxury wilderness experience and the opportunity to explore Western Australia's coral coast, stay at Sal Sales award winning lodge, nestled between the dramatic gorges of the Cape Range National Park and World Heritage-listed Ningaloo Reef. Breathtaking and unforgettable, the coast of Western Australia is one of the most pristine places on earth. It’s the isolation that makes this region all the more wondrous, unique and worthy to discover. The reef is the main attraction that visitors from all over the world come to see. Ningaloo Reef is the world's closest fringing reef and one of the most biodiverse coral reefs in the world. Accessible from shore, this extraordinary natural phenomenon stretches from shore to nearly 20 kilometres out to sea and covers a massive 5,000 square kilometres of ocean. Other popular activities to do in and around Exmouth and Coral Bay include swimming with the majestic and gentle whale sharks, watching humpback whales, plus snorkelling to see over 200 varieties of coral on a glass-bottom boat tour or experience one of Australia’s top ten dive sites at the Navy Pier. Step away from the marine activities and join a four wheel drive safari tour of the Cape Range National Park, and keep a lookout for the rare black-footed rock-wallaby. Cable Beach in Broome is one of the best places in Western Australia to watch the sunset but there are plenty of other gorgeous vantage points. Visiting Broome? Make certain to book a sunset camel ride, visit a beautiful beach such as Cable or Town Beaches or book a flight over the Bungle Bungles. Visiting Broome? No matter what you're craving, these are Broome's best restaurants, bars and cafes. Coral Bay is a favourite holiday spot and a great base from which to discover the only fringing reef in Australia - Ningaloo Reef. Scuba diving, glass-bottom boat tours and sea kayaking are all on offer here, and only around 90 minutes’ drive from Exmouth. After exploring, satisfy your hunger at one of the restaurants with menus offering a variety of cuisines including the famous local seafood. Around a 30 minute drive south-west of Exmouth, you'll come to Cape Range National Park. Pack a picnic and find a picturesque spot for lunch among the rugged red gorges and canyons. Or drive along the stunning coastine to one of the bays for a cooling dip in the ocean, walk along the sandy shores or spot the migrating whales between June and September. From the airport: Learmonth Airport is 36 kms from Exmouth. Exmouth Bus Charters provides a shuttle bus service into Exmouth. If you’re travelling to Coral Bay, transfers can be arranged with Coral Bay Airport Transfers. 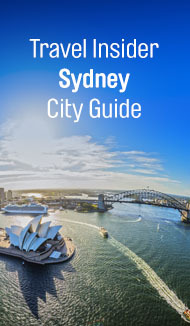 In and around the city: to explore the region and the reef you'll need to hire a car or book one of the many tours available. If you’re planning to visit the region beyond Exmouth it’s important to be prepared and let someone know of your plans.